On today’s pod, Andy and I would like to thank Brad and Brad over at WME, the writers’ room, our hair and makeup people who make us look beautiful every day, and our long-suffering wives … oh, sorry, I was having another one of my “episodes.” Let’s try that again. On today’s pod, Andy and I have a discussion about the Emmys. We ask the important questions: Was Homeland‘s coup of Mad Men expected? Does Modern Family‘s reign mean network sitcoms are back? Has anyone told NBC that? Is Tom Berenger still, spiritually and sartorially, in Romania? And what year is it there? Following our acceptance speeches, Andy and I checked the pulse of Parks and Recreation and The Office, the former coming off an episode that saw it in full flight, full of Capra-esque sweetness, Cheers-esque joy, and Roy Hibbert, while the latter … well, it’s the last season of The Office, guys. I somehow get very emotionally worked up about Jim and Pam, by the way; I know you were all waiting for that. So throw on a bow tie, Yo. 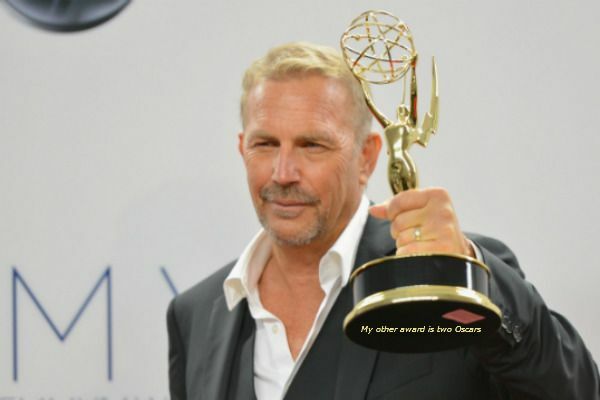 Or, if you’re Kevin Costner, don’t throw on a bow tie. Andy and I are here to guide you down the red carpet.